Wheat quality means different things to different people, depending on whose hands it’s passing through from harvesting until being consumed as bread. Farmers expect a high yield, millers expect a good milling quality and bakers expect flour suitable for the end-product they wish to produce. Consumers rely on their senses – what they see, feel, smell and taste. 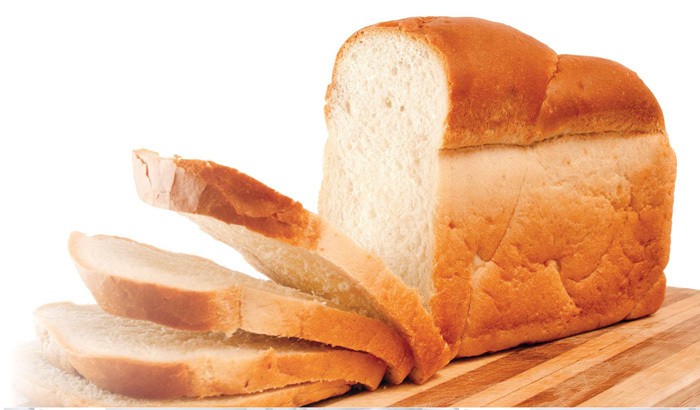 Therefore, quality regarding bread wheat means the specific characteristics that the wheat possesses to make it suitable for the final product – bread production. What is hectoliter mass and why is it important? Hectoliter mass indicates the density of wheat kernels and denser kernels yield more flour, therefore denser kernels are more profitable for millers. Denser kernels mean kernels are plump and well-filled. Stress-factors occurring during the grain-filling period of the wheat plant result in lower hectoliter mass. These factors include drought, excessive soil moisture, a shortage of nutrients, too little sunlight, too low or too high temperatures, insect damage and weather damage like frost and hail. The reaction that the kernels will have toward these environmental conditions though is under genetic control. Kernel shape, which can be genetically manipulated, also influences hectoliter mass – kernels that are rounder and having smaller grooves are preferable. What is falling number and why is it important? Wheat flour exists mainly of protein and starch. Starch plays the largest role in bread structure and if it rains on ripe wheat and favourable weather conditions follow, pre-harvest sprouting can occur. When this happens, the starch is broken down by an enzyme, alpha-amylase, and excessive sugars form (low falling numbers occur). The excessive sugars lead to ‘sticky’, runny dough and this dough is difficult to handle mechanically. Bread will also have a dark crust, a coarse texture and a poor structure and this results in bread that cannot be cut mechanically. Environmental factors like wet weather and day temperatures have a large effect on pre-harvest sprouting. Wheat tends also to be more susceptible to pre-harvest sprouting during the kernel-hardening growth-stage. This trait is mostly genetically determined and breeding lines that exhibit no resistance to pre-harvest sprouting are discarded during the early breeding phases. The environmental impact on this trait is large in South Africa, because only little genetic resistance to pre-harvest sprouting is currently available in the South African market. The effect of normal wheat versus pre-harvest sprouted wheat on the end-product can be seen in Photo 1. What is protein content and why is it important? Protein content refers to the amount of protein in a wheat sample. The unique proteins of wheat, namely gluten, make it suitable to be utilised for bread, pasta or biscuit production. A direct relationship exists between the specific type (composition) of protein and the end-product it should be able to produce. Gluten can be divided into a glutenin and a gliadin fraction, where glutenin confers stability to dough and gliadin confers elasticity to dough. A balance between these two fractions is important, because it will determine the quality of the end-product. Dough should be elastic to stretch during the fermentation process and it should be strong enough not to tear while it stretches – it must therefore trap the gas and allow the dough to rise and result in an attractive end-product. Environmental factors like fertilising and moisture availability, as well as the genetic background of a cultivar, can influence the balance between the different protein fractions. It is important to know that different cultivars will exhibit different loaf volumes at the same protein content levels, due to the genetic background. Nitrogen fertiliser leads to higher protein content – an increase in nitrogen availability leads to an increase in the gliadin fraction and this results in more dough elasticity. Moisture stress also leads to an increase in protein content, because less starch is formed. 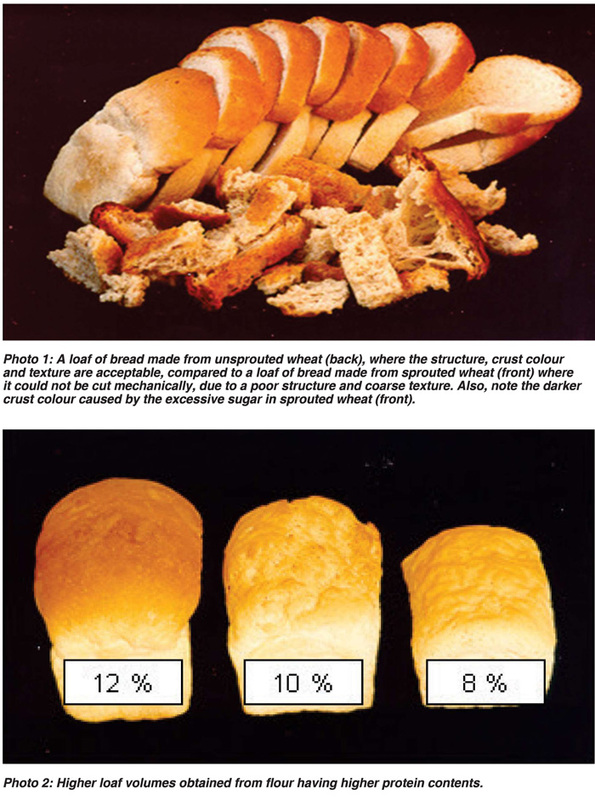 Usually, higher protein contents (within a normal range of 10% - 14%), will result in higher loaf volumes (Photo 2), therefore more profit for the bakers. It is important to remember that protein quantity (content), as well as protein quality (composition), determines the success of the end-product. It is clear that these three characteristics of importance to wheat producers are influenced by the environment, as well as by production practices and that their reaction towards these two factors is also influenced by their genetic make-up. The genetic effect also differs for each quality trait and the proportion that can be manipulated by breeding will therefore also differ. Wheat quality analyses confirms that South African cultivars adhere to acceptable standards set and that they perform well under different production practices and they are well adapted to different environments. This research was made possible by the Agricultural Research Council and the Winter Cereal Trust. Article submitted by Chrissie Miles, ARC-Small Grain, Bethlehem. For more information, send an email to milesc@arc.agric.za.